Hyper-converged infrastructure is touted as a simplified way to get the infrastructure and power needed to rapidly modernize IT environments. That’s all fine and well, but what do actual HCI users think? 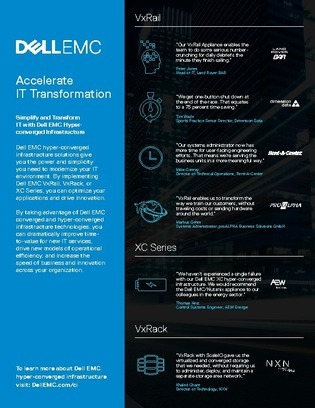 Click to check out the feedback that IT teams at some of the top companies in the world are giving about DELL EMC hyper-converged infrastructure and its range of supported appliances, and see what HCI is doing for them.